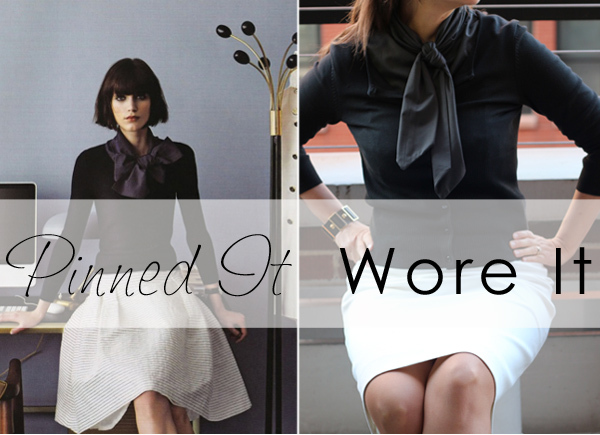 Welcome to the latest installment of Pinned It/Wore it, where I try to wear my Pinterest Style board. Today's inspiration comes from the photo below, which has been all over Pinterest lately although it's actually at least three years old, since I posted it on my blog in 2010, which qualifies as a classic look. Below is my version. Even as a less-than-exact match (no box pleats, no pullover, no bow) , it turned out to be an easy and wearable outfit. My outfit is 100% thrifted, right down to those Marc Jacobs flats. Regrettably, a full skirt similar to the one in the inspiration photos is hard to come by, especially in white. Ironically, full skirts (an "older" style) are only available from retails who cater to younger women. H&M had an awesome off-white full skirt as seen below on Laura at Buy Now Blog Later but it's sold out online. Maybe you can still pick one up in a store. It's not the same but you could also try this white jersey full skirt from American Apparel. 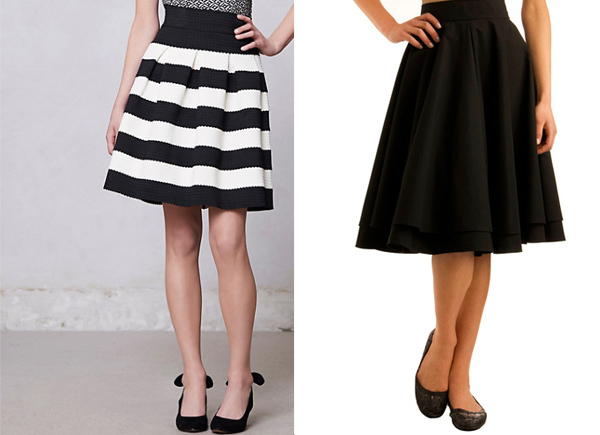 Above are two more options: a striped skirt from Anthropologie and a black full skirt from ModCloth. A similar full skirt available in red, navy green and black at Asos. Can you pull off a full skirt? How about a big bowed blouse? what an elegant feminine look. and the fact that the inspiration came from 3 years ago proves that classic style is always in.